As of Friday 7th September 2018 Essential plans are no longer available on Three. Essential Plans are Three plans that focus on value giving you a monthly allowance of minutes, texts and data, along with key benefits. They are available with Pay Monthly Phones and SIM Only plans for phones. Essential plans include 4G at no extra cost, free Wi-Fi on the London Underground and 4G Super-Voice. You also get 'Feel At Home In Europe', which lets you roam in 49 EU countries at no extra cost. Essential Plans are flexible too. You can set limits for minutes and data and get text alerts when you’re nearing them, so you don’t get any surprise bills. Essential plans don't include personal hotspot support (also known as tethering) or access to Feel At Home Around The World – which includes all of the Feel At Home In Europe locations and many more. So without this you'll get charged when roaming beyond the EU. They also don't include Go Binge, which lets you stream content from Apple Music, Netflix, Deezer, Lifetime, TVPlayer, Snapchat and SoundCloud without it coming out of your data allowance. Although even on Advanced Plans you only get Go Binge if you have a plan with at least 12GB of data. Essential Plans also don’t include free calls to Three customer services, instead they’ll come out of your allowance of minutes or be charged at your standard out of allowance rate if you’ve used them up. Advanced plans come with an additional 23 worldwide destinations which are Australia, Brazil, Chile, Colombia, Costa Rica, El Salvador, Guam, Guatemela, Hong Kong, Indonesia, Israel, Macau, Mayotte, New Zealand, Nicaragua, Panama, Peru, Puerto Rico, Singapore, Sri Lanka, Uruguay, USA, US Virgin Islands and Vietnam. Pay Monthly Essential Plans are much like standard Pay Monthly plans, in that you get both an allowance and a phone over a minimum term of 24 months. You can choose between 500MB, 1GB, 2GB, 4GB, 8GB, 12GB or 30GB of data and 300 or unlimited minutes, with all plans also including unlimited texts. Your monthly charge will of course be higher the more data you choose and the exact cost will depend on what handset you choose, but it will be cheaper than an equivalent Advanced Pay Monthly plan, as it won’t have certain extras like Feel At Home Around The World. As such a Pay Monthly Essential Plan is ideal if you want a new phone but don’t want to pay more than necessary. SIM Only Essential Plans don’t include a phone, but they’re cheaper and even more flexible than Pay Monthly Essential Plans. For one thing they can be either one or twelve months in length, so you don’t have to stay tied in for a long time. They also come with a wider range of voice allowances. You can see a breakdown of all the best current allowances and prices in the chart below. 2GB data 200 Unlimited texts Advanced SIM Only Plan. 12 month contract. Advanced SIM Only Plan. 12 month contract. 8GB data UnlimitedUnlimited texts Advanced SIM Only Plan. 12 month contract. Unlimited data UnlimitedUnlimited texts Advanced SIM Only Plan. 12 month contract. While Essential Plans only come with the basics (plus 4G Super-Voice and free Wi-Fi on the London Underground) it’s possible to add more to them. For example, you can add more data, which will last for a month. See the table below for details of amounts and pricing. This data still can’t be used for a personal hotspot (tethering) but you can separately buy an allowance for that. These also last one month and you can get 1GB for £5, 3GB for £7 or 6GB for £8. You can also buy an ‘International Saver’ add-on, which costs £15.32 per month and gives you 3000 minutes which can be used to call landlines or mobiles in Canada, USA, Puerto Rico, China, Hong Kong, Singapore and Thailand when calling from the UK. They can also be used to call landlines (but not mobiles) in Australia, Austria, Belgium, Denmark, France, Germany, Ireland, Italy, Japan, Luxembourg, Malaysia, Netherlands, Poland, New Zealand, Norway, Portugal, South Korea, Spain, Sweden, Switzerland and Taiwan. If you want to change your price plan long-term, rather than simply attaching a monthly add-on, you can do this from your My3 account. Special numbers and directory enquiry services are in many cases not covered by your standard Essential Plan allowance. 0800 and 0808 numbers are free, but for everything else head to the call checker to see the latest up to date charges. As Feel At Home Around The World isn’t included on Essential Plans you’ll also be charged extra to use your phone when outside the EU (or to call or text internationally from the UK). Roaming is switched on automatically however, so you’ll be able to use your handset abroad straight away. Exact charges will depend on the type of use and what country you’re in, but you can head to the roaming page for full details. 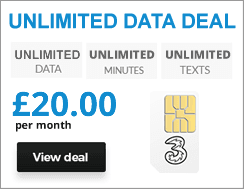 Note that data roaming is capped at £42.50p per month, to help you avoid racking up high charges, but if you’d prefer to have this limit removed you can do so by calling Three’s customer services. Note that unless you tend to roam a lot or call a lot of special numbers an Essential Plan could still work out far cheaper than most mobile plans, since they’re charges that are easy to avoid. Allowances don’t roll over, so any unused minutes, texts or data will expire at the end of the month. Essential Plan SIM cards can only be used in phones. If you want a SIM for a tablet or mobile broadband device you’ll need a plan designed for that.